To me, one of the most ubiquitous styles of watches are the squarish, TV-shaped models from the 1960's. I've heard fellow collectors poke fun at the myriad round models that all "look the same" but there are a lot of non-round models that look mighty similar too. For example, there is the Drummond, Gary, the Thinline 6500, and the Talbot, and the list could go on and on. In fact, I can add another one now - the 1963 Alan. It was produced through 1967. Like many of the TV-shaped watches, the Alan features a 10 yellow rolled gold plated bezel with a stainless steel back. The dial radial finished dial has engraved hour markers with applied numerals. One of the things that sets the Alan apart from other, more common, models is it features an American-made 8/0 sized 730 movement. 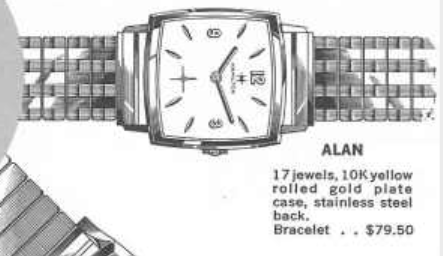 That would make the Alan a higher-grade model than it's counterparts with Swiss-made movements. My project watch arrived in the typical fashion. Everything looks to be original, although the crystal is a little beat up and ought to be replaced. The grey and burgundy strap will definitely have to go. The stainless steel back is unengraved and unremarkable. The dial is original and shows some minor spotting. It might clean up but if not, it will have to do - as it would be a challenge to get an equally pearlescent look from a refinished dial. The 730 movement is in great shape. The 730 is a shock-jeweled version of the 747 that was introduced in 1947. The reassembled movement is ticking away and ready to go on the timer. Un-oh... this is not what a well-running watch should look like. There should be two, consistent parallel lines. Something inside is making extraneous noise. It could be a tiny piece of lint or something hairspring related. I re-cleaned the hairspring and demagnetized the movement and it's running much better. It started off (on the right) running slightly fast but a little tweaking to the regulator slowed it down. The new glass crystal is slightly domed so it makes the finished watch a challenge to photograph. My camera just doesn't do this nice-looking watch justice! The dial cleaned up slightly but the minor spots are still present. Nonetheless, for being such an unassuming style, it's a nice looking watch. I just finished up the same piece. It came out very nice. I had to have a refinish though as the dial was dark just on one side. The 730 rebuilt nicely. How'd the refinished dial turn out? I think it's hard to get a radial finished dial done well. Did they do okay? The 730 is a great movement. Not as many cap jewels as a 770 but pretty much on the same level, quality-wise, in my opinion. Requires a complete disassembly, not something I would suggest without backround. Hi, are you selling any watches on eBay or Etsy? Thanks.